Question: When did you hear the first time the name OTRAG? Oberg: I first learned of OTRAG in the late 70s, when I was working at the NASA space center and was preparing for the space shuttle launch in mission control. I was also working with some private groups that were interested in space colonization like the L5 society. In their magazines they talked about OTRAG. And although there was no Internet there were lots of reports about this very interesting potentially groundbreaking rocket development in Germany. The articles I saw were very positive. Because here was another new project that could lead to much wider human access to space – and cheaper access to space. This was very exciting. Question: Were everyone enthuisastic about it? Oberg: It became clear that OTRAG was not an official program, but we’d call it a disruptive program in modern terms. They were disrupting the economy of the European Ariane program, and even perhaps of the Space Shuttle program. And as the years went by it was also clear that many governments did not like the program for two opposite reasons. Some people said it was just a scam, it was just a hoax, and would never work. And other people said it was worse, it might work and would bankrupt the official programs. Oberg: As far as I can recall any previous private rocket groups were pretty much amateur groups just launching rockets 10 or 20 kilometers up. And this was the first attempt that I can recall that involved trying to get into orbit with a private group. Since then it has been done with several private groups, and more groups have been joining all the time. But it was definitely a pioneer of that concept. Question: What did you think when you learned that Otrag decided to launch the rockets in Zaire? Oberg: The announcement that they were going to launch the rockets in Zaire, from the rocketry point of view made perfect sense. You wanted to launch rockets into orbit around the Earth with a maximum spin of the Earth giving you a push. But we do the same thing in the US from Florida. And the Russians did the same thing from their base in Kasakhstan. The Chinese are been building new launch sides for the very same purpose. So that is normal to do. You also want a large open area where rockets that don&apos;t work can fall harmlessly. So, the idea doing it in Zaire geographically made sense. As it turned out diplomatically it was a disaster. Oberg: Those ones who watched the African events in the 60s and 70s realized that Zaire, the former Belgian-Kongo, was a tumultuous place, with civil wars and major problems. With being given independence without a proper civil service or infrastructure. So, there had been a number of wars back and forth. Also, the Southern end of Africa was involved in the confrontation with the South African regime. And the Sovjets themselves had established two client states in Angola and Mozambique that were in the forefront of their plans, their political plans for the continent. In hindsight putting a rocket base in the middle of an area of existing diplomatic and military confrontations was foolish, was imprudent. Oberg: The program was taken seriously after the first launch in 1977 because they really had a rocket. And in that case the question was could these guys actually do what they&apos;re promising. And that was the most terrifying thing. That what they promised was a threat both to the economy of the shuttle, the economy of Ariane, the economy of other countries. But it wasn&apos;t just Mobutu. Kaiser said, he would launch space satellites for anybody. And that was of serious concern to both the US and Sovjet military programs. They knew about each other&apos;s programs, they did not like the idea of other countries having the same even less sensitive, even less good resolution, less quality pictures as they were getting. Because there were things that they couldn&apos;t hide from each other, but they wanted to hide from the rest of the world. The idea that Kaiser could actually launch a satellite, and a satellite with a camera on it was terrifying. Oberg: The hostility of both the American and German and Russian space programs and their own spy apparatuses was one thing, the question is what to do about it. It turns out the events in Africa were already in motion to cause trouble. Having a Russian campaign against a military base for testing military missiles was the kind of fake story the Russians excelled in. There was a major propaganda campaign in Africa against European interests of all kinds. And again South Africa for good reasons. And the rocket base became a focus of this propaganda campaign. It was at the point actually where additional invasions of Zaire were being planned, and justified by the existing of this alleged military test range being built in the heart of Africa. There were political cartoons, there were speeches, there were diplomatic letters all about the poor OTRAG company suggesting that these were weapon tests. Question: Can you tell us something about this campaign? Oberg: By the late 70s stories began appearing in West European publications that were sponsored and paid for by Moscow, by the group there for what they call the Desinformatia, the disinformation. Which is black propaganda. Fake stories to persuade people who don&apos;t realize the stories are coming from Moscow or Prague or other areas that were all involved in. And one of the stories involved the OTRAG base being used to test missiles. The propaganda was to create a fuss and to excuse any actions taken against Zaire in general for supporting this kind of alleged thread to the other countries. Question: But it was also easy to construct, to build up such a story because everything happened in the jungle, no one could really verify. So it was really a kind of James Bond setting? Oberg: It was easy to make those kind of accusations because it was in a remote area of the world, you couldn&apos;t just drive down and look at it. The reason it was in a remote area of the world was because it was a rocket base. It&apos;s the same kind of system that the US builds his rocket bases near coasts to launch rockets over the ocean. The Russian built their rocket base in the middle of the desert, they weren&apos;t people living around. So, Kayser and his people built the rocket base in a testing area where there were not many people living. Kayser invited people to visit the side. There were several media visits there. They saw that there was no enormous tower for launching rockets. There was a log drypot with a hoist on it for putting the nose on top of the rocket. There were no underground facilities and communication centers like James Bond would build. It was just a place to launch medium size or small size rockets. 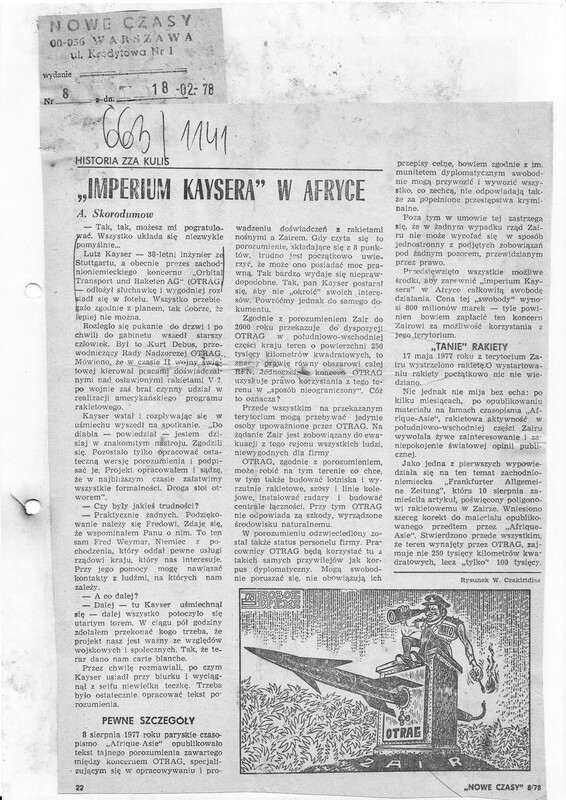 But Kayser&apos;s rocket people kept running into the issue of military use of their rockets. And it was unfair in terms of rocket scientists. I am a professional rocket scientist, you know, I have a T-Shirt that says that. I worked a number of years in mission control in Houston, and we&apos;ve launched vehicles. And controlled them in space. There are different things you need for a military rocket and a space rocket. The rocket that Kayser was building had the features of a satellite launch vehicle. It would make a very poor military rocket. But the differences were not to easily explained at a TV news clip for the news. So, people could rapidly see it&apos;s a rocket. Question: Do you think that Kayser did react always in the right way? Or was he also kind of sometimes the reason for the problems? Oberg: Kayser&apos;s reaction to these accusations were initially being puzzled by them as far as we can tell, puzzled, and very patiently explaining the technical reasons why the accusations were false. And he was absolute correct in all of his descriptions. But he absolutely was clueless about how to make a point to the public. And to see, well, how do you reassure people. He&apos;s been so close to this project, and he knew it so intimately that he just thought it was a matter of explaining it more clearly. It was too late for that. Question: What happened then when the pressure always, getting more and more pressure on OTRAG? Why did they leave Zaire? Oberg: At a certain point it became impossible for the Kayser people to stay there. There were enough threats of more invasions and more diplomatic problems. The Sovjets were putting a really big push. Sovjet diplomats were giving letters of complaint to the German govenment and the French government and the Zairian government. Question: Where did OTRAG go then? Oberg: The principle of launching satellites as efficiently as possible is to get as near the equator as possible, so you get the biggest spin of the Earth as it rotates. So, being in Zaire was a perfect location for that, not for other reasons. Other countries along the equator perhaps in Brazil they had their own rocket programs. Countries in Asia they were some countries interested there in renting an Island, an Indonesian Island. But the country that the OTRAG people went to next was Libya. There it was a little further off the equator, but was very hospitable to rocket engineers working on rockets, because the Libyans obviously had full intentions of fulfilling all the false propaganda against OTRAG in Zaire as a military missile. The Libyans wanted someone building a missile they could use for military purposes. And they were glad to welcome the OTRAGteam. Question: So, now the pressure came more from the American side and less from the Russian side? Oberg: The pressure on anyone building a missile for the Libyan regime would come from people who are in the line …. in the gun sides of that rocket, and that would be Israel. And so clearly Israelis and through them the United States did not like the rocket being build in Libya. The Israeli didn&apos;t resort simply through diplomatic notes, there are many cases or other foreign governments were building weapon systems for enemies, people sworn to destroy Israel like Iraq. Whereas the Israelis would send a few polite warnings, and then a few threats, and then they would eliminate the threat. Question: Do you think that the rocket could have flown? Oberg: The big question that rocket scientists wondered about is could it really ever have worked. Was the idea too bold, or to say in English, too flakey, too crazy to work. The consensus among people I&apos;ve talked to, who actually build and blow rockets up is that, no, the concept was interesting, but in the years since then many other companies including private companies have built and launched successfully commercial access to orbit. None of them followed the design that OTRAG had planned, the staging system, the hardware systems. They used cheaper components. And the feeling that I have come across is that enough things could have broken at enough points that a big multi stage version of the OTRAG rocket was never going to work. It might not work at all, it might only work half the time. But it was an idea that was too far advanced of the of-the-shelf technology that they intended to use. Question: What happened to Lutz Kayser? Oberg: He run off an Island like Luke Skywalker. We need people like Kayser to keep pushing the envelope and pushing the technology beyond where it&apos;s even rationally plausible. Because we have to find out where that boundary is. Space technology is by nature a life threatening technology. It is so difficult to build a rocket, to get into orbit without any useful payload, you have to cut corners everywhere you can. But knowing where you can and can&apos;t cut corners remains a question for human judgement and human failure.OTRAG will be a lighthouse to other projects. Now, a lighthouse is often thought of as a guided beacon. Actually a lighthouse is sitting on rocks, warning people, warning of danger, don&apos;t come too close, you&apos;ll hit the rocks, go around, find a new way. So, that&apos;s what a lighthouse really means in the old days. So, OTRAG as a lighthouse, I think they could be proud of that reputation.